Senator Gipson is holding the first annual Veterans and Families Fair. The event will be held on September 28 at The Ramada Inn Conference Center; located on 542 Route 9 in Fishkill from 9:30am until 12:30pm. The event will feature Senator Gipson’s Veterans Hall of Fame to recognize outstanding veterans in the district, and will include more than 50 vendors with services, products and information for veterans and their families. The Senator will also will be honoring World War II veterans at the event. Everyone is welcomed to attend! 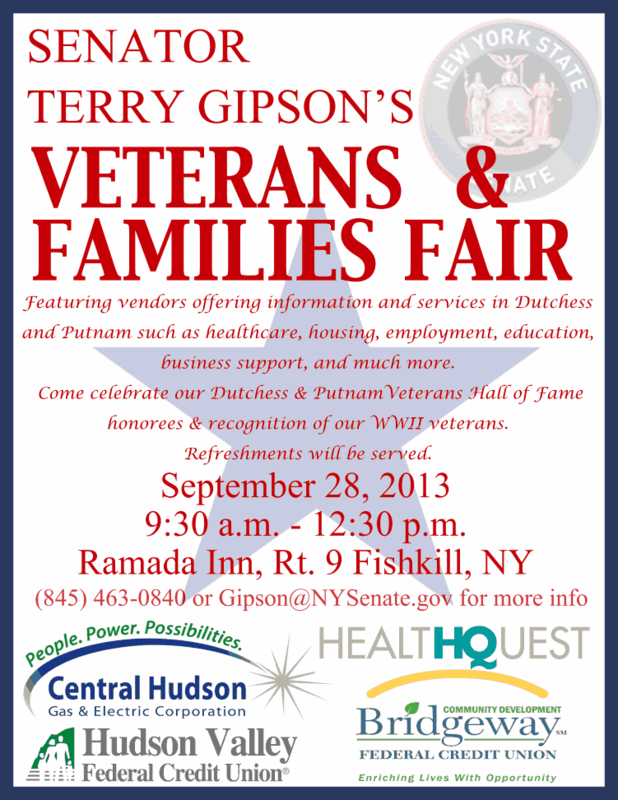 Posted in Local Happenings and tagged Dutchess County, Senator Gipson, The Ramada Inn Conference Center, Veterans and Families Fair on August 23, 2013 by Dutchess County Legislator Francena Amparo.